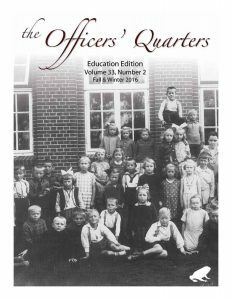 Officers’ Quarters Education Edition, Volume 33, Number 2, Fall & Winter 2016. The Officers’ Quarters is the official publication of the York-Sunbury Historical Society. Publication dates are biannual: Fall & Winter, Spring & Summer. Annual subcription rate for The Officers’ Quarters for non-members is $20. Article submissions for The Officers’ Quarters are to be addressed to the Editorial Committee and received at the Society Office (see contact). Past Editions of The Officers’ Quarters can be purchased at the Fredericton Region Museum. New editions can be purchased at Read’s News Stand on King Street in Fredericton. If you are interested in acquiring copies or articles from previous editions, please contact the Museum office for details.